Many of us are familiar with the Pengaton's Cheetah robot — the world's fastest mechanical mammal. But that feline brute is rather big and, well, even a bit severe. Thankfully, there's now a kinder, gentler version — the cheetah-cub robot. 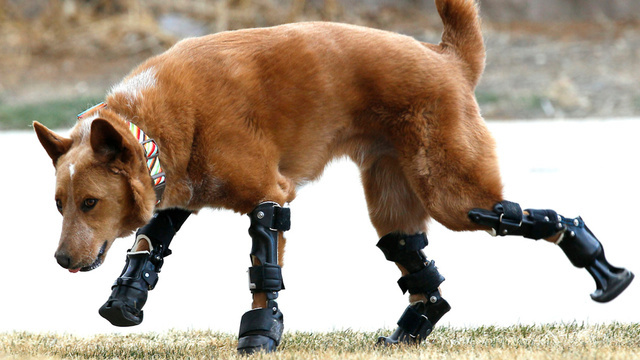 Naki’o lost all four of his feet to frostbite when he was abandoned as a puppy in a foreclosed home. Now Naki'o is a prosthetically enhanced super-animal with awesome superpowers like TURNING YOUR COLD, STONY HEART INTO A MUSHY PILE OF RAW EMOTION.